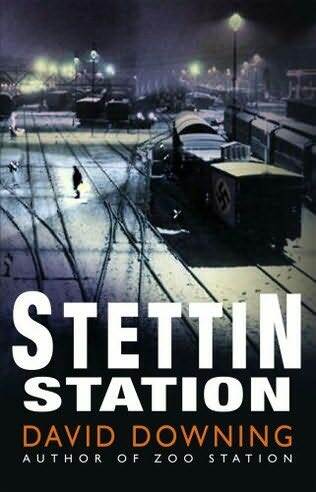 In STETTIN STATION the third of David Downing's spy series set in Nazi Germany, which follows on from ZOO STATION and SILESIAN STATION, John Russell the Anglo-American journalist is living in Berlin waiting for the seemingly inevitable entry of the United States into the war. It is November 1941, and as the German armies push towards Moscow, Vice Admiral Nagumo's carrier strike-force sails through the Northern Pacific towards Pearl Harbor. While Russell files bland stories to avoid the attention of the German censors his beautiful girlfriend, film actress Effi Koenen is reluctantly making propaganda films for the Nazis. One of Russsell's other concerns is that his 14-year-old son Paul, living with his ex–wife, is a member of the Hitler Youth and subject to Nazi indoctrination. Russell and Effi are not the only Berliners who hate the Nazis, and Russell with his contacts in the Communist underground is monitoring the removal by train of Berlin's Jews to an unknown fate in the east. While acting as a contact between the Abwehr, the Military Intelligence and American intelligence, Russell is sent by Admiral Canaris, head of the Abwehr, on a mission to Prague with the promise of a reward of safe passage to Switzerland, and subsequent frequent visits from Effi. When the mission is unsuccessful Russell tries to retrieve the situation and becomes involved in an attempt to smuggle out of Germany, evidence of the involvement of European subsidiaries of American companies in the Nazi war effort, including the purchase of a massive amount of Zyklon B gas. This is a tense spy thriller that is particularly good at evoking the stark terror of living under the Nazis, and reminding us there was a German opposition to Hitler. When reading fiction about Nazi Germany you sometimes think that the author has written an anecdote to add ambiance, and it is a shock to "google it", and discover it is fact not fiction. Downing's account of the fate of Joachim Gottschalk, a German heart-throb movie star of the 1930s, his Jewish wife Meta Wolff and his son Michael is one such sad story. Downing's main strength is in creating the bleak atmosphere and in detailing the depressing minutiae of life in wartime Berlin. There is an incredible amount of detail concerning Russell's movements around the geography of the city and sometimes you feel you need a map to follow the narrative. John Russell is an honest man, who loves his girl friend Effi, his son Paul, and Berlin the city that has been his home for many years and who faces, because of the war, the terrible prospect of losing all three. He may appear a little bland in comparison with some of the quirky heroes of other novels, but this story is all about building up the tension and stress of waiting for that knock on the door from the Gestapo. This is not a cheerful book, and there is little of the humour that is such a feature of Philip Kerr's work, but it is well worth reading for the insights into Goebbels' propaganda machine, the lives of ordinary Berliners, the conflicts between the Nazi hierarchy, and the tense believable plot.